Discover an untouched sites and territories of your beyond imaginations!! 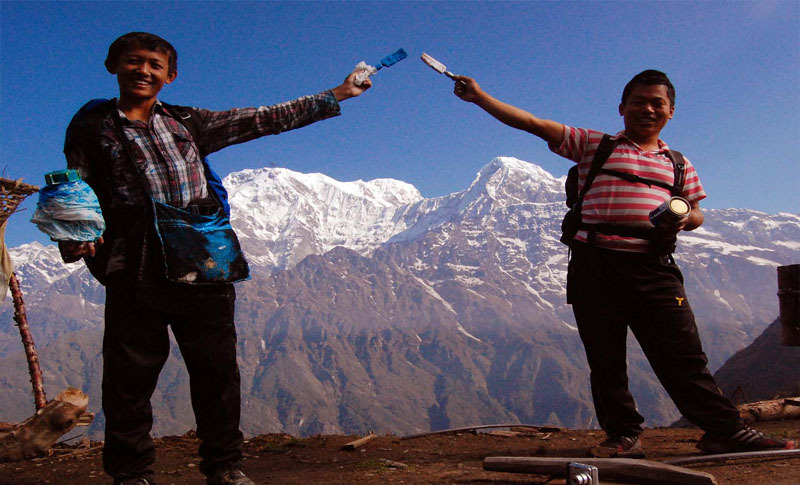 Annapurna Seven Passes Trek is one of the most extremely adventurous; a place where you can immerse yourself in authentic cultures, purely lush and untouched natures and be inspired by the tremendously spectacular mountain scenery on the planet. It begins at Tal village and Karte Manang and ends at old Jomsom the lower Mustang. Total distance of this strenuous trail is 225 kilometers. Asal and I; each of us lost minimum of 10 kg weight and gained well resilience! Most part of this trail is very confusing (no trail signs!). Do not try to walk it without an expert guide, which is totally unsafe! And beware of some guides and agencies in Nepal; they might try to offer this trek to their clients without a field experienced guide, which is even dangerous! We got lost about 4 hrs at Namge Kharka a huge meadow! People of Meta and Nar told us that very often the local herders also miss the location while they return to shelter, especially in monsoon season. Last time Asal and I did visit there in July, we were covered by so thick fog, even it was very difficult to see 5 meters distance. But at the same moment those people said; October – November and April – May, you will have the best opportunities to view the mind blowing scenery. Best time to trek it; whole October/ November and the last week of March to mid. May. You can do it, 70% camping and 30% basic tea house. And if you don’t get a plenty of time for it then can be broken into sections. 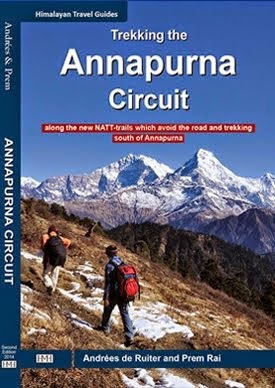 The Annapurna Seven Passes trek is designed with the combination of old and new trails throughout the Donalake valley including Tripple (Ghoa) pass – Tache and Kuchumro pass – Phu and Nar valley – Manang and Mustang valley via Tilicholake and Mesokanto pass. The Terila Pass trail to upper Mustang also connected with this trek. You also need to take care of the special permit for Phu and Nar. And compulsorily bring crampons and necessary climbing rope with you. The spectacular flight takes you to Lukla and the start of the Everest panorama trek to Namche Bazaar, the colorful center of Sherpa life (The place of Yeti and home of the Mount Everest), then you will continue trek to holy Tangboche monastery below the distinctive peak of nearby Amadablam and Everest. 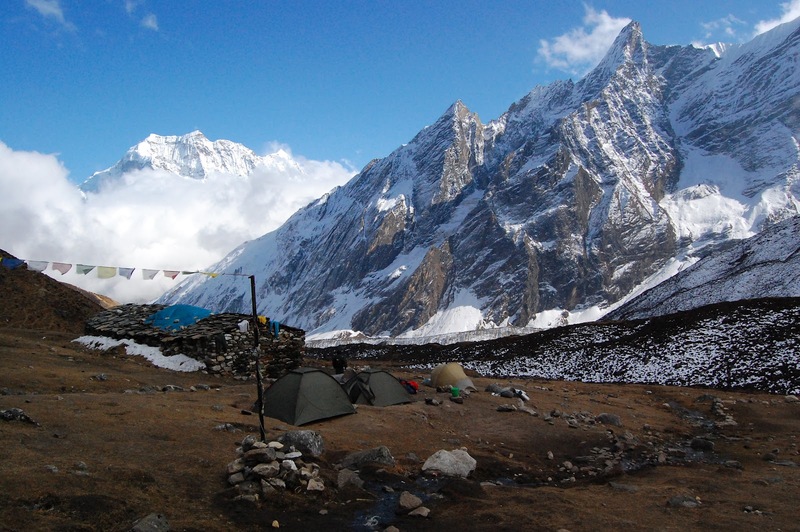 Your effort is rewarded by the stunning view of Everest rising behind the wall of Nupse & Lhotse. An awe inspiring panorama of Himalayan giants: Kwangde, Tawache, Everest, Nuptse, Lhotse, Ama Dablam, Kangtega and Thamserku etc. 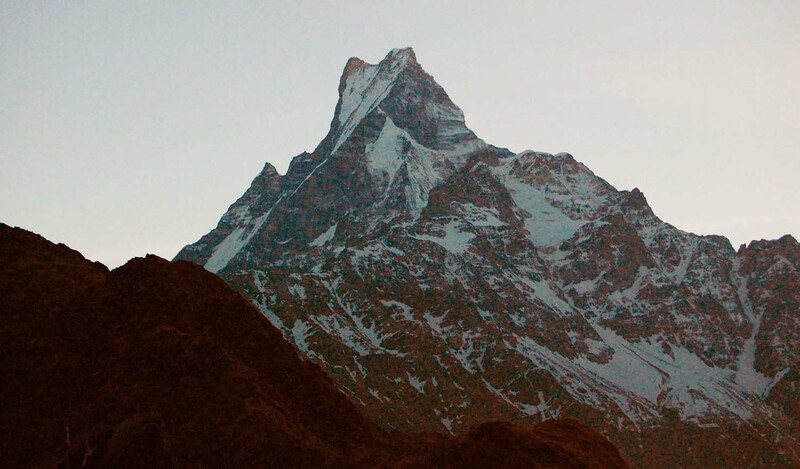 On this classic first-timers Everest hike or trek through the legendary Khumbu Everest region, your senses come fully alive, and all the views are magical. But not only for its proximity to Mount Everest, but also for its friendly Sherpa people, picturesque villages, diverse ethno-cultures, colorful festivals and monasteries. As we attempt to understand the rich Sherpa culture, we soon enter an endless maze of woven stories and tales, including those of the mysterious yeti! This festival is celebrated at the monasteries of Tengboche, Thami and Chiwang right after the full moon of autumn. The monks with elaborate masks and costumes on, perform o series of ritualistic dances of the triumph of Buddhism over Bon the ancient animistic religion of Tibet. On the first day of the festival, Lamas of the monastery pray in the courtyard. The second day, you can see the Lamas dancing with brocade gowns and wonderful painted paper-mouth masks. Hundreds of Sherpas from all over Khumbu attend the performance, as it is an important social occasion as well as an entertaining spectacle. Along with the serious and intricate dances the Lamas also dramatize two absurd comic sequences that make the entire performance a grand and amusing event. On the final evening of Mani Rimdu the villagers joint in an all-night Sherpa dance. We have following trips of kala pathar Everest base camp which allows you to grace festival at Tengboche. 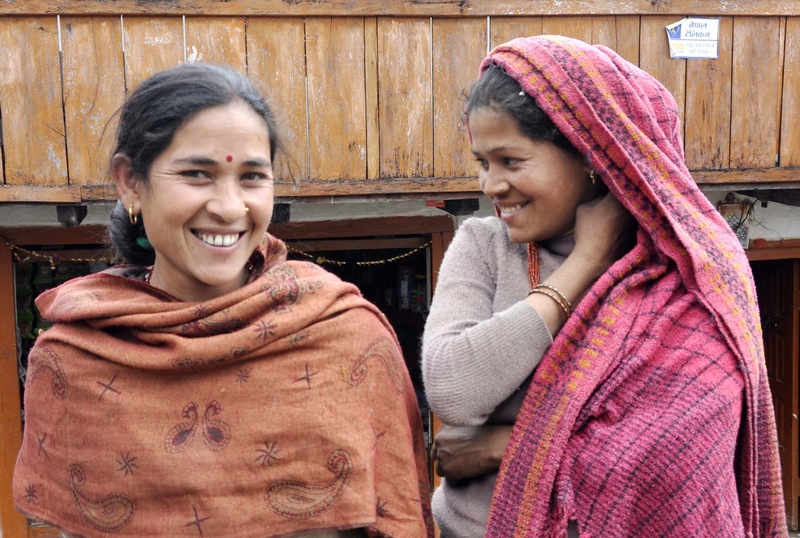 Having known Prem & Maina Rai for over ten years, I cannot imagine better trekking guides. Whatever your desires for your trek, from the idlest, slow leisurely paced wanderings to the toughest challenges (if you wish to to the highest lake in the World, they will get you there! ), they can meet them. They take wonderful care of you….with much laughter and enjoyment. My last experience of travel with Prem & Maina was the trek to Everest Base Camp, November – December 2009. My companions were very fit but I had thought I would have to stay at Namche Bazaar, having had a hip replacement and arthritic knees, at the age of 66. But they were happy and confident that we would sing and dance on the Kalapathar peak 5545m and, thanks to their great spirits and competence, we did. And picnicked and took photos for four hours in the sun, overlooking Everest and watching distant avalanches! This was a tribute to their total care for every aspect of our well-being. We all stayed healthy with just one incidence of Altitude Mountain Sickness (which can just happen anytime); Prem has life saving skills to deal with this, and a mere half an hour of his garlic head Massage brought me round. Both Prem and Mina, who have been practicing their skills for years at their clinic in Pokhara, are highly skilled in ayurvedic massage and, unbelievably, managed to include their massage oils in all the baggage they were carrying; we returned healthier in every respect, and I am sure it was a tribute to their skilled massage that I arrived home much fitter and with no need for painkillers! This is not to mention their skills in cooking (wherever lodge owners allow them in their kitchens), story telling, knowledge of flora and fauna, and Prem’s ability to rush over nearby peaks and bring back excellent photos of the wild life and dramatic footage. Fortunate indeed are any trekkers who have Prem and Maina or either one of them alone, for their guide to the beauty and challenges of the Nepalese mountains. DAY 01/Nov.15/09: Kathmandu – Lukla by flight and then trek to Chheplung 2660 m/3:30 hours. DAY 04/Nov.18/09: Trek to Namche Bazzar 3440 m/7 hours. DAY 05/Nov.19/09: Acclimatization day in Namche, visit to the Musium, joint at slight show, walk up to Everest view hotel and Khumjung village etc. DAY 07/Nov.21/09: Trek to Pangboche 3930 m/6 hours. DAY 08/Nov.22/09: Trek to Dengboche 4360 m/5 hours. DAY 09/Nov.23/09: Acclimatization day in Dengboche, day hike up to ridge beyond prayer flags, you have chance to great view of mountains and Imja tse valley include Makalu Mount. DAY 10/Nov.24/09: Trek to Dughla 4620 m/4 hours. DAY 11/Nov.25/09: Trek to Lobuche 4910 m/4 hours, then same day been up to the Moraine piles of rock northern side of Kmumbu glacier, awesome! DAY 12/Nov.26/09: Trek to Gorakshep 5141 m/5 hours. DAY 13/Nov.27/09: Summit day up to Kalapathar 5545 m/4 hours. DAY 17/DEC.01/09: Trek to Chhatyang kharka (Pokhara Guest House) 3570 m/7 hours. DAY 19/DEC.03/09: Rest Day in Namche, had chocolate cakes, shoping at the Tibten market. DAY 20/DEC.04/09: We had very good chance to see Everest Marathon held at Namche. DAY 21/DEC.05/09: Visit to the Namche Local market then descend down to Monjo 2840 m/6 hours. DAY 23/DEC.07/09: Trek to Lukla 2830 m/6 housrs. DAY 24/DEC.08/09: Fly for Kathmandu – transfer to Summit Hotel. DAY 25/DEC.09/09: Kathmandu sightseeing, shopping, taking sauna and Massage etc..
DAY 26/DEC.10/09: Sightseeing, shopping and preparation for next day departure. DAY 27/DEC.11/09: Transfer to International airport and departure Home. On 24th of May, 2012, three of us, Guide Mahesh Kulung Himalaya Lodge & Restaurant owner of Landruk, Shyam Rai, and I left for Mardi Himal Trek to mark the trail with blue/white colors. We did everything as volunteers. Although the ACAP officers, Mr. Lal Prasad Gurung and Mr. Narendra Lama had promised to pay something for the paint, brushes and our food and accommodation, it seemed to be taking too long to process. As my friend's time was limited, we decided to leave as early as possible and finally decided on the right time for it. We were happy and very dedicated doing it, and I was greatly inspired to do so by Mr. Andrees de Ruiter. This is a beautiful and rich nature trail, best thought of as a “Ridge-trail”! because most of the time you hike along the ridge beginning from Kande, one of the best starting points for this trek, situated 36 kms. north of Pokhara. You have to follow this ridge west, until MHBC (Mardi Himal Base Camp) .The altitude starts from 1770m at Kande and reaches 4500m. at the end point ,MHBC. You hike through just a few villages in the beginning, and at the end of the trek some particularly beautiful villages. On this trek you will have to spend 80% of the whole trip in dense pristine forest! This is a very quiet and peaceful trek – we met only an Italian tourist with a guide during our whole trip. I would like to recommend doing this trek with a minimum of 2 people or taking a Nepali guide, because it’s very peaceful and quiet and far away from access to any village. This fascinating trip is a mixture, being both adventurous and peaceful and joyful. Above all, when you reach high camp , at 3900m, or the upper view point at 4450m, the views are breathtaking: the snow- capped peaks include Annapurna I ,8091m, Annapurna South ,7219m, Himchuli ,6441m, Annpurna Fang (Baraha Shikher) ,7647m, Khangshar Kang (rock noir) ,7485m, Gangapurna ,7454m, Mardi Himal 5553m, Machhapuchhre’s (fish tail), both peaks (6997m – 6993m) and the beautiful sloping landscape to the south. For those who don’t like to walk where many other tourists are hiking, then Mardi Himal Trail is perfect to do, and if you have more than 16 – 18 days for a trekking trip in Nepal, you may also combine it with the Khopra trek, including the hot spring in Jhinu Danda (1750m) at the shore, Modi khola, coming from Annapurnas . It would also be possible to go to other Tatopani (hot springs) in the Kaligandaki valley. There are many confusing trails into the dense forest: everywhere you can see the small trails walked by yaks and sheep, which look similar to the main trail. 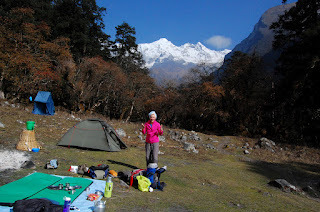 An officially some years ago, The Mardi Himal Route was open for the trekkers, but you don’t feel it so when you are in the dense forest of it and some narrower paths above high camp! In my experienced there are many places along the trail need to fix and put more signposts, poles and metal bar etc. Originally it was made for yak and their herders, sheep and their shepherds. Seasonally, lower villagers go up to the forest and up to the sloping grassy lands to take things like bamboo and dhakai, a kind of wild vegetable, wild mushroom and some Himalayan herbs and Yarsa Gumba (cordyceps sinensis) . I hope our blue/white signs will help you to find the right trails although I’m not sure how long they will last; hopefully the monsoon rain won’t wash them away. In the forest we tried to mark 10 or 20 meters between each, in both directions. I believe marking on the tree will last longer, because there are fewer chances of the signs being washed away by the rain. Below and above High Camp, we marked on the rocks only, some of which were difficult to see, and there are long distances between the signs so you need to look for them carefully. Summary; The Mardi Himal Trek is a beautiful, wild trek, into pure nature- a true gem of the Himalaya, a quiet and peaceful environment. It may be a bit adventurous but it is a more joyful destination for those who like to be away from the hectic rush of civilization. There are two transport options : if you want a cheap drive then you would go to Baglung bus station ( the new bus park) and catch a bus to Kande, which costs around 2 Euro, but it would take more than two hrs, because the bus stops at many places to collect passengers. The other option is to hire a taxi or car; it would bring you to Kande in 1 hr maximum. Recently it cost around 15 Euro for a single drive. Kande is a small town with little tea shops, restaurants and cold stores. In the middle of the town, there are some NATT signs painted with red/white on the stone wall and a wooden electricity pole, which you can easily recognize. When you go by a cab or car, you may ask the driver to drop you right at the starting point for Mardi Himal Trek. It’s easy to find. You turn to the right hand side and slowly continue further, through small villages and houses; soon you will start ascending and enter the bushes and forests of rhododendron and red sandalwood with beautiful southern views. You will reach Australian Camp, a very beautiful little village. From there you can see the Annapurna mountain range, and a little of Manaslu and the Dhaulagiri range including Fishtail Mount and Pokhara valley in the south. There are good campsites and four nice lodges. I would prefer to sleep here, but for a first day the trek to Pathana is also nice. Australian Camp is famous around Pokhara for a picnic spot with easy access and a beautiful mountain scene. This place is surrounded by red sandalwood and rhododendron forest. The trail begins through a beautiful and pleasant short descent in the red sandalwood forest, and then let’s says, “Nepali flat “to Pathana. Sometimes you will get to see few red/white NATT-signs. At Pathana, there are 6 nice basic lodges, 2 little bhatties and a big new lodge about to be built. There is an ACAP permit check point + tourist information centre as well. Please make sure that all your necessary permits are arranged in Pokhara beforehand. Pathana – Pitam Deurali 2100m (45 min). Pathana to Pitam Deurali is a wonderful hike in the red sandalwood and rhododendron forest and with some little open land between, known as buffalo pasture. After some minutes on the flat there is a slow, gentle climb up and then a bit more uphill until the flat resting place at Pitam Deurali. In between you can see some ACAP signposts and our NATT- logo in red/white. If those signs are taken away, you have to follow the straight direction; do not turn either left or right. At Pitam Deurali, there are two basic lodges and one bhatti. 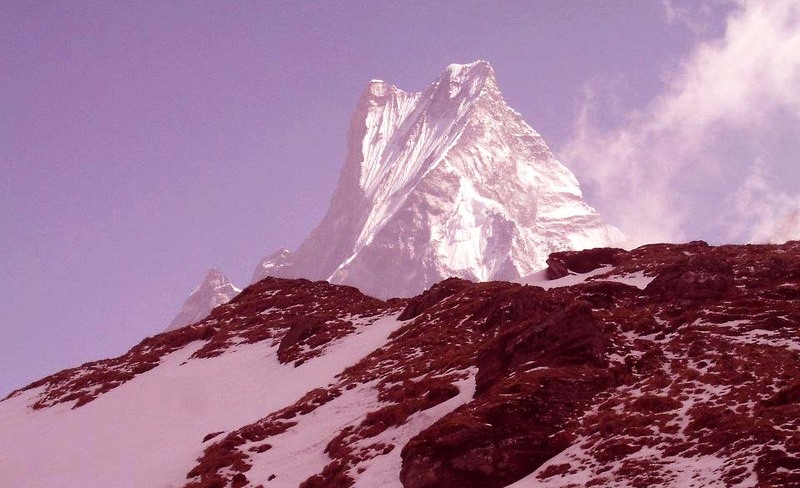 Now is the official start of the Mardi Himal Trek. Leaving behind the Trekkers Inn Lodge, there is an ACAP signpost saying Mardi Route (Forest Camp). We did paint on the pole of ACAP signpost and at the corner wall of this lodge; you also clearly see the steps on the wall between the signpost and the lodge’s, behind the side wall. When you go up the steps, you immediately turn to the right and go straight, entering the scrubby forest. Then you can follow the blue/white sign. Most of the time we painted on the tree barks as there were only a few opportunities to mark on rocks. 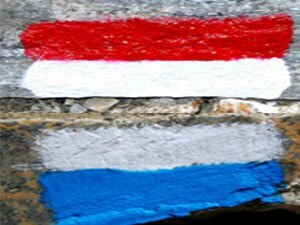 You climb gently and in 15 – 20 minutes, you reach a little area of open land, which is buffalo pasture (you might not recognize it as a pasture for animals) where we made a larger mark on the rock in blue/white color. Coming to this pasture you might get a little confused but if you look carefully, there should be no problem finding it. After the pasture you enter a dense forest and you will gradually climb up (for 2 to 3 hrs). Then most of the time you hike on Nepali forest” flat “(a little up and down). Finally, after a short, gentle descent you reach the flat at Forest Camp. From some places between Pitam Deurali and Forest Camp, you will have the chance to see vistas of Dhaulagiri and the Manaslu range. If the weather is good , I suggest you to take a packed lunch or something to eat and plenty to drink as there are no lodges, restaurants, villages or water- only dense and very quiet forest. 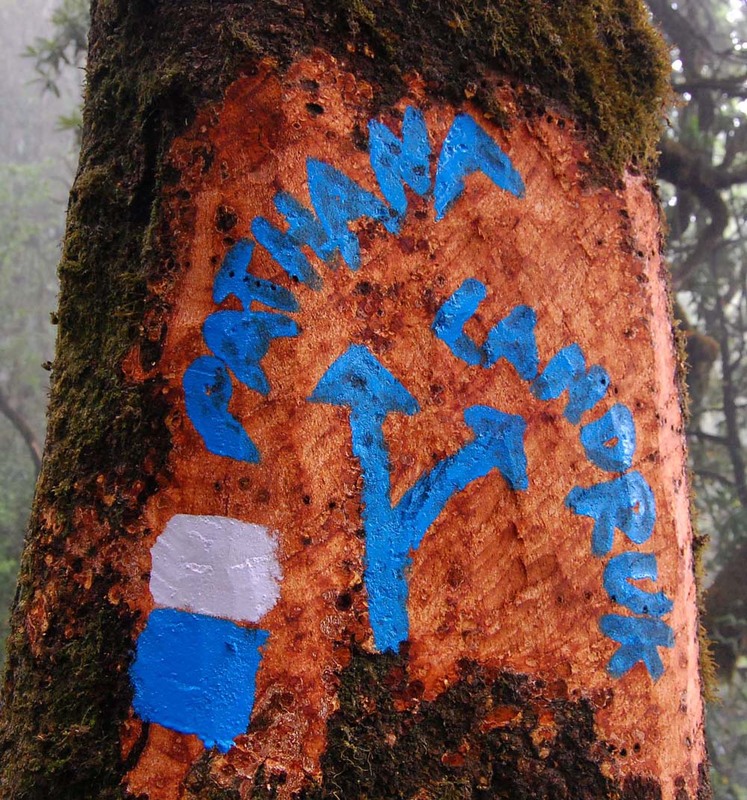 Between Pitam Deurali and Forest Camp there are more than two signposts showing directions to Lwang village on the other side. Do not turn left or right, just go straight, following the directions of the blue/white colored signs. At Forest Camp (Kokar), there are three nice basic lodges. The menus (daal bhat, noodles, soup, potatoes, chapatti –tarkari, beer, coke, canned juices, teas and coffee) are good, and the food clean and fresh. Rooms and toilets are neat. This little village is surrounded by beautiful green forest. They have nice campsites as well. From here there is also a trail going down via Sidding, Lwang and Pokhara. On the western side you can see Ghandruk and surrounding villages and Modi valley. The lodges of Forest Camp are open the whole year round; you may give them a call before you go there. 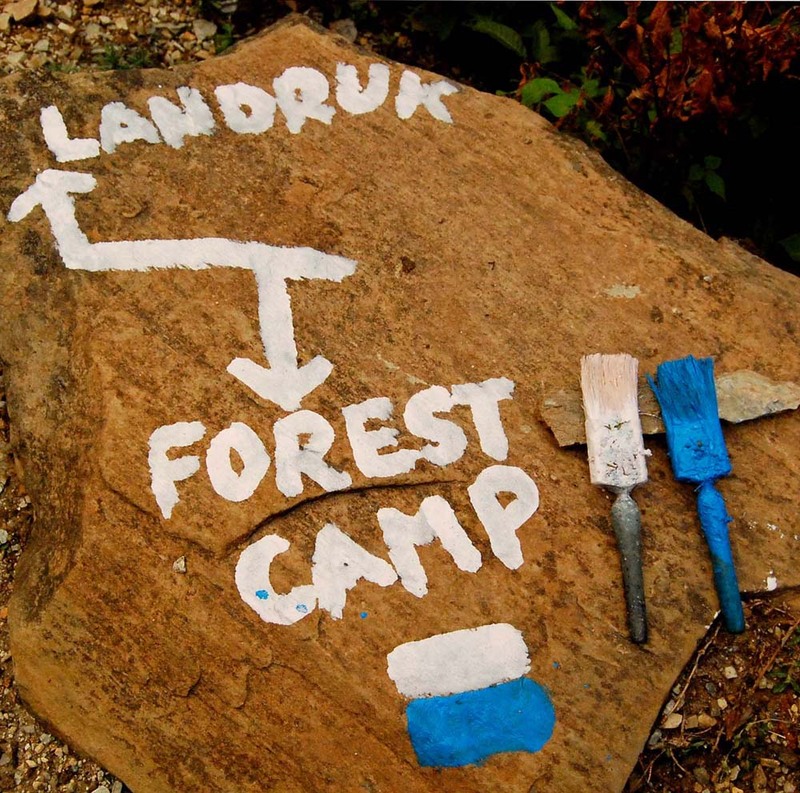 Forest Camp (Kokar) – Rest Camp 2700m (45 min – 1 hr). The trail goes through the courtyard of Hotel Forest Camp and Restaurant. At the corner wall of toilet we painted and put a little arrow. You follow the blue/white mark on the tree bark. The hike is an easy uphill start from right behind the Hotel Forest Camp. After 7 to 10 minutes, you will turn right and walk straight, going gently up and down. Finally you will climb up and you will reach Rest Camp. There is a basic teahouse there with a few bedrooms to sleep in; they also have the same menu as Forest Camp, although I think they are able to prepare less food. They have beer, coke, teas and coffees as well. Rest Camp – Low Camp (Humal) 3000m (2 ½ to 3 hrs approx). The trail starts from the end of the right corner of the teahouse and soon you can see the blue/white marks on the tree bark. Most of the time it is a gradient ascent, after just a few meters , turn right and continue straight; there is some uphill and “Nepali flat” then later there are mostly gradual trails, ascending into the dense rhododendron forest. Before 15 – 20 minutes; you reach a flat trail; finally you’re at Low Camp. There are two basic teahouses with restaurants with similar menus to Forest Camp. This is a very beautiful place with a beautiful campsite as well. It is surrounded by a beautiful rhododendron forest, a very quiet and peaceful environment, with a view of Machhapuchre and Mardi Himal, when the weather is clear. The teahouses are closed from mid May – end of July, but if you make a phone call a few days earlier, they will open the restaurant and rooms for you at any time. From here (Low Camp) a trail goes down to Sidding and further villages as well. You still follow the blue/white sign, entering the scrubby rhododendron forest by a gentle ascent of 10 – 20 minutes, and then start going up the trail in the dense forest till reaching the lower viewpoint (3289m). This will take 1 ½ – 2.00 hrs. Now begins a grassy slope. From here you can also see many wonderful mountain views, especially at sunrise and sunset. Now, you continue further up to High Camp, hiking mostly on the grassy slope, up steep and some narrow paths and into some little rhododendron forests. Sometimes you may find difficulty in seeing our signs, because it was very difficult for us to find good rocks at the right distances. Sometimes we also had to use small rocks to paint on so when the grass grows higher those signs may be hidden. If the weather is good, this hike is also one of the nicest, because you have the chance to walk along the yak beaten trail on an open ridge with great mountain views: the Annapurna range , Machhapuchre,and the southern green landscape; below, can be seen the very deep Modi river valley, including Ghandruk, Chhomrong, Sinuwa and Dovan . At High Camp, there is only one teahouse at present (though another teahouse is about to be built soon), named Hotel Trekkers Paradise & Restaurant (mobile phone; 9846087624 or 9846087625 or 9806691496 to Mr. Sudip Gautam, who has been playing an important role in promoting the Mardi Route). It has nice basic rooms and can sleep a total of 24 people at once. It also has a wide and beautiful campsite. There is a good dining hall, an Indian sharing toilet and bathroom. They have a menu: available are noodles, macaroni, chapatti, Tibetan bread, soups, daal bhat and vegetable curry, egg items, tea and coffee. This place itself is a natural viewpoint tower! In all directions you can see breathtaking views, including Machhapuchre, Mardi Himal, Annapurna I, Annapurna South, Baraha Shikhar, Himchuli and the southern slope including Pokhara valley! This place is also very suitable for yak and sheep-you can see many yaks around. Oh, Madhav Gautam, the yak herder, gave us fresh milk! Fantastic Himalayan milk!! There are a couple of yak shelters as well. Today you should start earlier, but do not start in the dark if you don’t know the trail. You still see blue/white signals till Upper View point. After you have hiked 20 to 30 minutes, further on to the trekker’s paradise of High Camp, there is a trail junction at the bottom of a high hill. Though it seems the real trail goes directly up through the dangerous steep hill, (and yes, some crazy trekkers and local people would take it because of the shortcut), I would never recommend you to do so, for then you would put your life at risk! MHBCW (Mardi Himal Base Camp W) 4500m, to go from the upper view point Mardi Himal Base Camp will take about 30 minutes only. Coming down to High Camp Hotel would take 3 – 4 hrs maximum. Except for some hundred meters of narrow path, it is not that difficult, as long as there is no snow on the way. This day trip is quite adventurous, beautiful, joyful and definitely worth it. 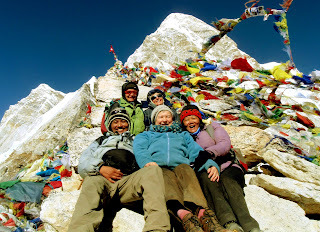 On 7th of November 2011, there were nine members including Dr. Claudia we left for Manaslu trek. It was good idea to leave Kathmandu early to avoid the traffic gridlock and (all being well) arrive at Dhadingbesi (580m) by lunch time. It is roughly a 4 hour bus trip. Dhadingbesi is a big city and it is headquarter of the district. After having lunch here, we continued driving to Arughat (608m) of Gorkha. We arrived there by late evening, because of the bumpy rough road. At Arughat, there are many campsites and lodges to stay overnight. We did set our tents in middle part of the town, which is after the bridge over Budigandaki. Mainly Newars and Gurung people live in this town as both sides of the river. You can view west face of Ganesh Himal Range. There is a police check point as well. For Lapubesi we did hire a jeep to drive till Sotikhola (700m), it took us (1 hr and 40 minutes), between we mainly crossed Arkhet (620m) and Kurepani (820m), and both villages are beautiful with its farming terraces, green scrubby hills around. After getting off the jeep, we officially began hiking to Khorsanebari (750m, 1 hour), had lunch here and then continued to Lapubesi, took us almost (4 hours) including some little break. Lapubesi is a beautiful Gurung village with farming slope terraces. 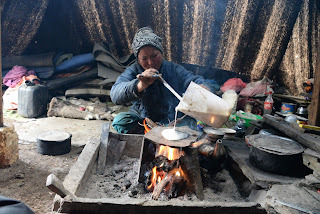 Where there are few basic teahouses and nice campsites, health post and telephone service are available. All the way to Tatopani trail goes along the west bank of Budigandaki, its pleasant hike just above the river through the scrubby forest and villages sometimes, between the villages of Khanibesi (970m) and Machhakhola (869m) and Khorlabesi are also good place to stop, at those places have some basic teahouses and nice campsites. We did stop at Machhakhola for lunch, from where you can view the north east Ganesh Himal. Tatopnai means; hot spring, there are no pools made yet, only spouts good to wash things and take shower. At Tatopani there are two basic teahouses and nice campsite right above the River of Budigandaki. The trail from Tatopani to Salleri is through a dramatic gorge with many water-falls and few landslides. At the end of the Tatopani village, cross a suspension bridge to the east bank of the river and continue sometimes dense forest to Dobhan 1070m (1 hours and 30 minutes), still keep hiking along east bank of the river to Yaruphant 1170m (1 hour and 20 minutes), where there are few tea shops and nice campsite at the shore of the river, we had lunch there. Few hundred meters climbing after Yaruphant you reach at the confluence of the Yara Khola (1 hour and 30 minutes) vertical cliffs rise on both sides of the valley as the trail continues on eastern bank for 15 minutes to a bridge, after a short climb and descent of 20 minutes you reach a flat area, where there are few tea shops and campsites. 10 – 15 minutes further, you enter Jagat 1340m. There are basic tea houses, telephone services, nice campsites; police check post and MCAP information center + you’re an officially entered to Manaslu Conservation Area Project (MCAP). Jagat is traditional tax collection point for trade to and from Tibet. From here you can view the Shringi Himal. 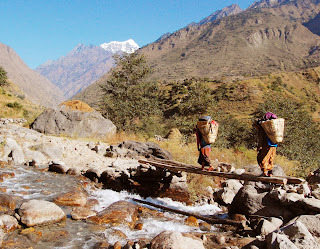 Beyond the village is the Pangaur khola about 20 minutes, cross using stepping stones and Log Bridge and in next 20 – 25 minutes you reach to Salleri, there are couple of campsites in the village. The trail now climbs an easy gradient to the resting place (50 minutes), good view of Shringi Himal. Descend to Sirdibas 1420m (35 – 45 minutes), continue via Ghatte khola to a long and high suspension bridge over the Budigandaki (there is police check post before crossing the bridge) and climb steeply 200m and reach to Philim 1570m (40 minutes). At Philim, there are some basic tea houses, campsites, telephone services, Chhyoling Sandu gompa, nice Gurung village and a beautiful Shringi Himal view etc. In (45 – 1 hour) you come at Eklebhatti 1600m, where, we had lunch, during food preparation time, we did collect some mountain paper from the tree. We did also collect fresh wild nettle leaves and cooked soup for lunch! Next 45 minutes from here, 5 minutes before the bridge, there is a trail junction right hand trail goes to Tsum Valley and the left hand trail (Manaslu trail) descends to the river, where the trail begins a gradual climb as the valley turns westwards, keep following the main trail, soon you come at Nyakphedi 1660m. Another bridge across the Budigandaki is reach in (45 minutes), in the next 15 – 20 minutes, you cross back the same river using wooden suspension bridge and then you reach to Pewa 1700m (30 – 40 minutes). Next 50 minutes to 1 hour to Deng is good to stay overnight, there are couple of basic tea houses and good campsites with Shringi Himal views. Gurung people live in this village. The trail descends to a suspension bridge over Budigandaki , and then climbs roughly 110m to Rana village 1910m (45 minutes), now you climb up gently, some Nepali flat and come at Bhiphedi 1990m (45 – 50 minutes, keep continue further hiking through sparse pine trees and hamlets (1 hour), we had lunch at Sallaghari and then hiked to Ghap 2200m (1 hour and 30 minutes), there are couple of tea shops. The valley now narrows and you pass through pine broad leaf forest to a spectacular canyon carved by the river (1 hour), which you re-cross in another 20 – 30 minutes on a large bridge. From the second bridge, you climb more steeply for almost 1 hour and 40 minutes to Namrung 2630m, where there are some tea houses, good campsites, permit check, hydropower + you can view Shringi and Ganesh Himal. Leave Namrung by crossing Therang khola along an easy hike and you reach the scattered village of Barchham (30 minutes). The trail now climbs about 290m, on an easy gradient to Lihi 2920m (1 hour and 10 minutes), there are some tea shops and campsites are available. Descend and cross the Hinan khola and ascend an easy trail to Shyo 2880m (1 hour). Now, its an easy uphill to Lho 3180m (1 hour and 30 minutes), where there are few tea houses and campsites. 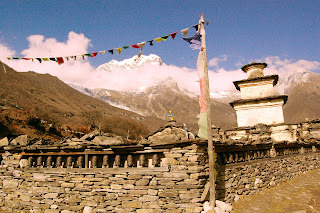 Its quiet a big settlement with the views of massive Manaslu and other peaks. If you have time, explore the village’s maniwalls, Ribung gompa, which situated on a hill above the village. Then the trail descends to Thusang khola and climbs a steady gradient for 300m to Shyala 3500m (1 hour and 45 minutes). At Shyala, there are some tea houses and nice campsites. For mountain views Shyala is wonderful place. The trail dips through the Numlakhola before descending slightly and then becoming flat all the way to Sama 3520m (1 hour and 30 minutes). Where, there are many basic tea houses, nice campsites, many big maniwalls, chhortens with beautiful Manaslu, Naike peak, Larke and Samdo. There is police station as well. “ It is always good idea to stay one or two more day at Sama; exploring the village and some of the surrounding view points as part of an acclimatization program. You also may visit the gompas of Sama + hike up to Birendra Lake 3640m (45 – 1 hour) to see the reflection of the Manaslu and Naike in the lake! 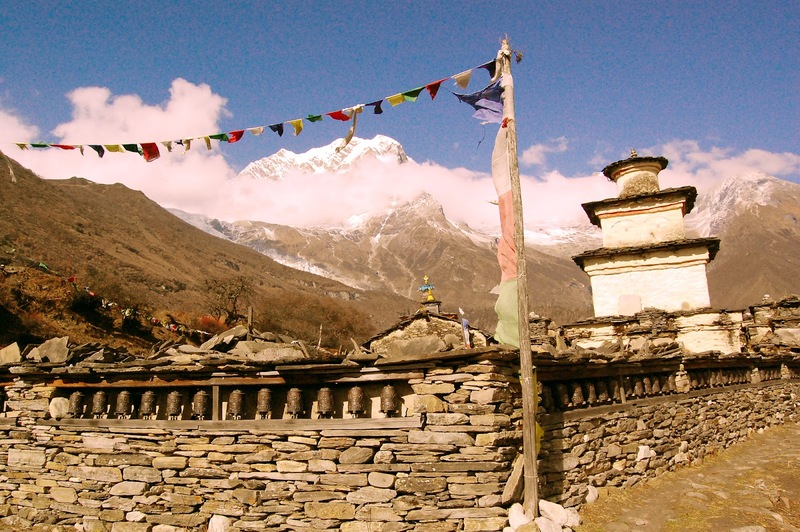 Another very popular place to visit is; the Pung Gyen gompa beneath the east face of Manaslu. To get there, you go back on the Shyala trail to a junction before the Numlakhola, where you should turn right and continue a long and sometimes steep climb for 3 hours. For the gompa donation is expected, so you may donate as you wished. Still higher above is cave gompa and hotspring, but relaxing in the grassy land near the gompa and enjoying the view of Manaslu is popular pastime before returing to Sama (1 hour 45 minutes)”. Because of our tight schedule; we continued towards Samdo 3875m, following an easy trail that runs parallel to the Budigandaki. After 45 – 60 minutes cross the outflow from Birendra Lake to summer herding area of Kermo Yak Kharka, where there is an excellent view of Manaslu from the impressive maniwall. An easy gradient trail continues for (1 hour) to a bridge over the river and climb towards up to Samdo 3875m (40 minutes). 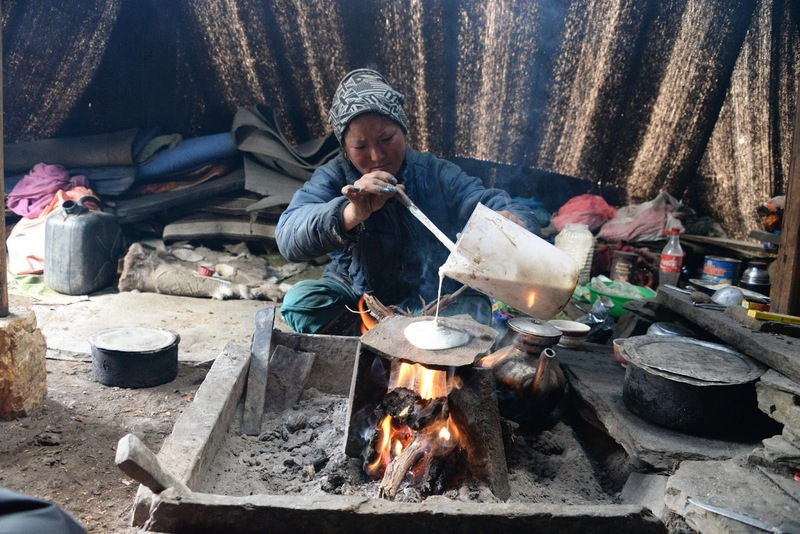 At Samdo there are two basic tea houses and many beautiful campsites, there are big chhortens and a gompa as well. Comparatively the people of Samdo are poor. It is good idea to add one more day to your itinerary for well acclimatization. 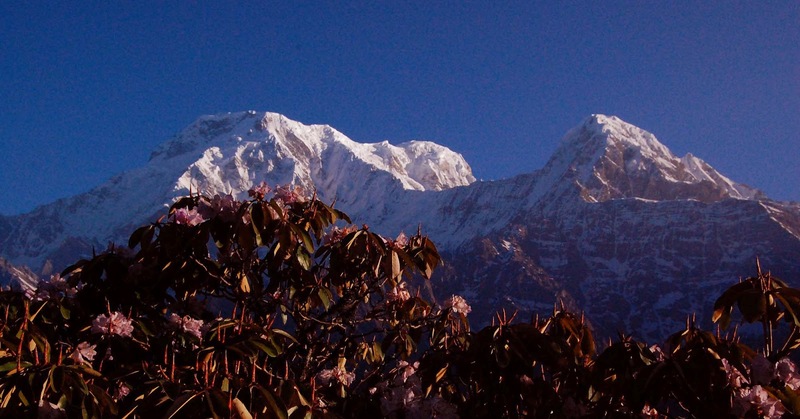 Consider climbing up the slopes to the north of Samdo for some great view of whole Manaslu range. From Samdo the trail continues to a bridge across the Gyala Khola, climb the trail on the far side to a large pile of mani stones (50 minutes). 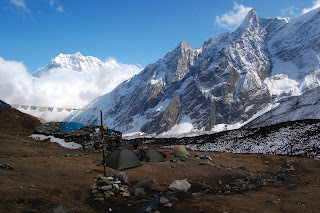 Now you climb an easy gradient with the views of Naike, Larke and the north face of Manaslu for 2 hrs and 40 minutes to Dharamshala 4460m, where there is a large emergency shelter, recently set up a couple of large Chinese tents to sleep in. We did start at 5am, before sunrise and climb an ablation valley to view of Cheo ridge. Some prayer flags on the top of the valley 4690m (1 hour and 45 minutes), but still to get to the Pass, trail crosses through rough moraine (1 hour and 20 minutes to the another shelter 4905m. 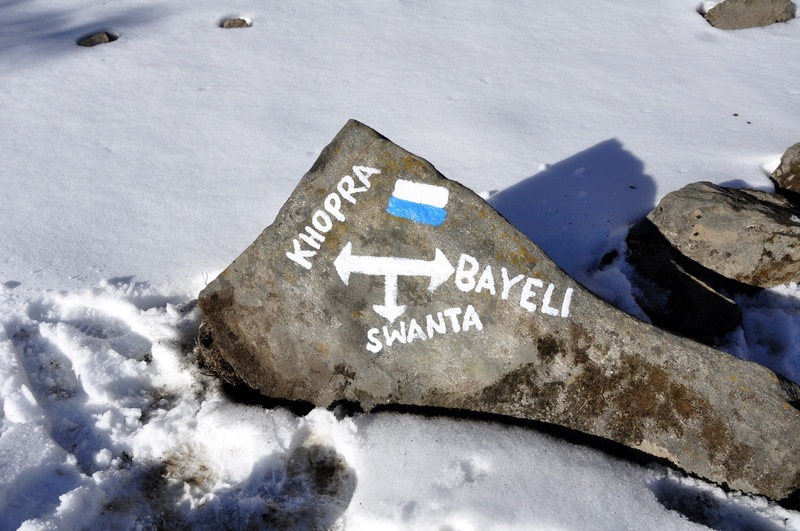 From here the trail begins to climb more steeply to the top of the Larkya La 5160m (1 hour and 45 minutes). On the top of Larkya La is a roofless shelter you can see and many prayer flags. In the south, right in front of you is standing a huge massive white wall of the Larkya Himal range and in the north Cheo and Pawar (Cheo) Himal range. After 15 -20 minutes’ descent; a magnificent view of Himlung, Kang Guru, Gyagi, Menjung, Annapurna II and IV. Now, you descend on the steep slope, which is covered by snow or icy in winter and spring season (and may require a hand line) for 1 ½ hrs. But in Oct/Nov. season is very dry and normally no snow or ice over the pass of steeply slope down, though I would carry 20 – 30 meters rope with me. Beneath you are three glaciers spotted with several turquoises lakes; head for the ablation valley to the left of all the glaciers. And rough gradient leads down to campsite of Bhimtang 3720m (3 hrs) belong to 6 tea shops including newly built. As I’ve seen many people take an extra day to have relax at Bhimtang after many day tough hiked via Larkya La, well Bhimtang is a bit windy place, so we made a decision to descend down to Yak Kharka, which decision was perfect. It took us 2 hrs and 30 minutes exactly without any break. “After 15 – 20 minutes you hiked from Bhimtang will reach a moraine with fantastic views of Manaslu west face and Ngadi Chuli (Peak 29) in the south east, Himlung and Cheo Himal in the north. Now, you cross a branch of glacial melt and then turn left, cross some more moraines before crossing the main stream of glacial melt and then climbing ridge of lateral moraine topped by few prayer flags (15 – 20 minutes). The trail descends a little steeply through pine and rhododendron forest for 20 minutes and soon you meet to a gentle downhill gradient and keep continue towards the Dudh Khola through beautiful forest and you arrive at Yak Kharka, there is a large tea shop and very nice campsite area surrounding by green forest with the view of the north Manaslu and west part of Larka Himal. From here the trail condition is a bit difficult to follow across some big landslides and through scrubby forest to the scattered settlement of Kharche 2700m (1 hour and 30 minutes).The trail now climbs strenuously ridge that just into the center of the valley before a long descent to Goa village 2515m (1 hour and 45 minutes), where there are couple of tea houses. It is now an easy downhill to the large Gurung village called Tilje 2300m (1 hour), we did lunch break here. And then you cross a bridge and pass a school, after 20 – 30 minutes we came to join the new broad dirt track and we continually followed it till to the suspension bridge, crossed it and reached to Thonche village 1930m (55 minutes). At the center of this village, you bit turn to left and descend to the suspension bridge over Marsyangdi River, in 10 minutes you come to joint to the main Annapurna circuit NATT trail at Dharapani 1925m. Where there is a police check point, so you’re checking out of Manaslu and checking into Annapurna (ACAP). In Dharapani, there are several lodges to stay. We descent through this long village till end and cross back the Marsyangdi river using the suspension bridge and followed the left bank trail of the river, finally we reached to Karte Manang 1850m (30 minutes). The school’s ground was provided us to us as campsite; well you should pay the fee as school asked. It is situated just above the Marsyangdi River. At Karte, there are few numbers of tea houses. After 1 hour you hiked on the broad dirt road without any single traffic, and then cross a suspension bridge (to avoid the road) over the Marsyangdi River and passing narrower carved cliff trail through the deep gorge with beautiful waterfall views, and descent at the river bank and continue a head to Siran Tal 1730m (30 minutes). After 5 minutes, you get to hike through the cliff carved trail and descent at the main Tall village 1700m (20 minutes). Where there are several lodges, police station, telephone services, and safe drinking water station and at the far end of the village is Nepal Army post, right from here the trail descends to Lower Tal (30 minutes), entering to scrubby forest and you come at Sattale 1640m (45 – 50 minutes). Still you have to descend down to another suspension bridge is rough + steeply and scrubby forest trail, cross the bridge and ascend to join the road at Chamje 1430m (45 – 60 minutes). Where there are some lodges. We did stop for lunch break. Now we took walk all the way to Jagat 1300m (1 hour) on the broad dirt road without any single traffic. Jagat is beautiful place to stop as overnight. Where there are several tea houses and nice campsites. It would be good idea to book it earlier, before you arrived here, because good campsite would be occupied by others. It was our last night of this trip + also was one of our client’s “Birth Day!” Our Chef Bak Dhoj Rai made a delicious cake! All staffs wanted to have alcohol and everyone had it and finally we all danced and sang many beautiful songs and we all enjoyed it very much! We hired a jeep to Besishahar, took us 3 hrs actual driving and then we did change a car for Kathmandu took another 5 hrs, transferred to Hotel. Thus our wonderful Manaslu trek was over safely and in good health! Day 16:Nov.22/2011: Transferred to the International Airport and fly home! Lakeside - 6, Khahare Chowk Pokhara, Nepal. EBC (Everest Base Camp 5367m, Kalapathar 5545m, Chola pass 5420m, Gokyo peak 5483m, & Renjola pass 5360m, then get into the Bhote Koshi valley trek. Trekking to these regions conjure up image of great challenging & Achievement – tinged with the romance & thrill of being so close to the World’s Highest peaks. 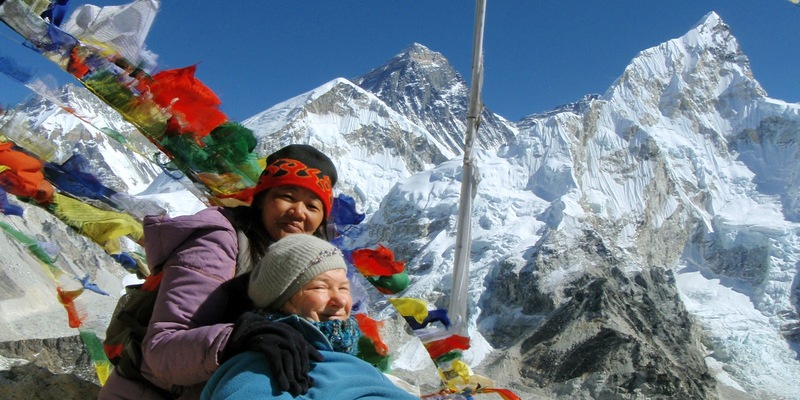 Justifiably these treks are most popular treks in Nepal, famous not only for its proximity to Mount Everest, but also for its friendly Sherpa people, picturesque villages, diverse ethno-cultures, colorful festivals & monasteries. As we attempt to understand the rich Sherpa culture, we soon enter an endless maze of woven stories & tales, including those of the mysterious YETI. Your combined adventure trek starts from the tiny airfield of Lukla through Sherpa villages, forests of Fir & rhododendron & crosses high suspension bridges where you will see caravans of Dzopkyos (a yak – cow breed). Our trail enters Namche Bazzar, the Sherpa “Capital” nestled in a horse shoe bowl with its colorful bustling market with traders from local villages & as far away as Tibet. Above the tree line the scenery is stark but spectacular & the incredible monastery at Tangboche, set against the backdrop of Amadablam, Everest & other huge snow capped peak, is a photographer’s paradise. With time for acclimatization en route, our goal is Chhukung Ri 5546 m, Everest Base Camp on the Khumbu glacier 5367 m, climb up to Kalapathar 5545 m, then an adventure to the Chola pass (Chhugyuma) 5420 m, Gokyo Ri peak 5360 m, Renjo la 5340 m. For breath taking views of Everest 8848 m, Cho Oyu 8153 m. & its surrounding peaks. A trek to these region is a classic adventure, selected among the World’s 20 Journeys of Lifetime! 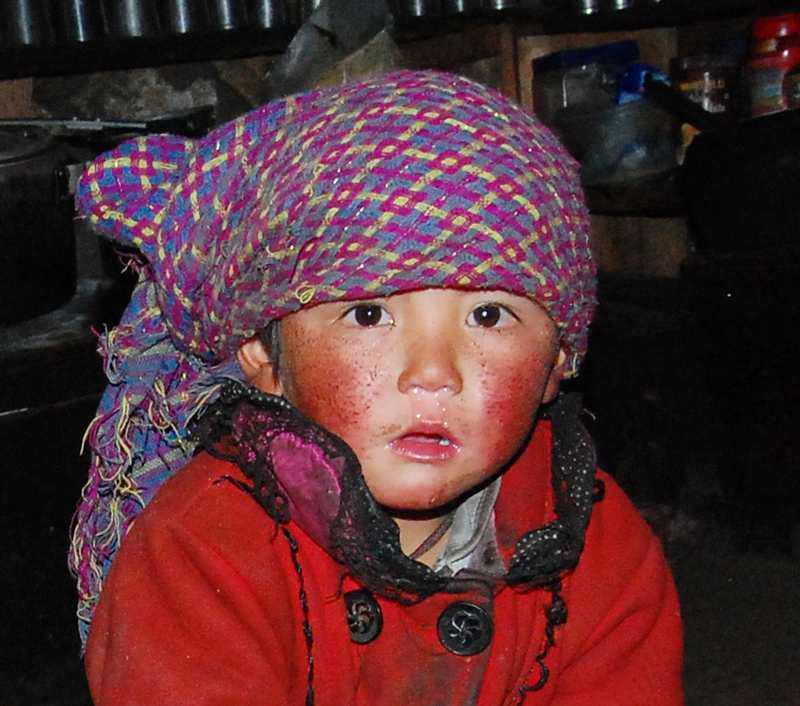 This festival is celebrated at the monasteries of Tengboche, Thame and Chiwang right after the full moon of Autumn. The monks with elaborate masks and costumes on, perform o series of ritualistic dances of the triumph of Buddhism over Bon the ancient animistic religion of Tibet. On the first day of the festival, Lamas of the monastery pray in the courtyard. The second day, you can see the Lamas dancing with brocade gowns and wonderful painted paper-mouth masks. Hundreds of Sherpas from all over Khumbu attend the performance, as it is an important social occasion as well as an entertaining spectacle. Along with the serious and intricate dances the Lamas also dramatize two absurd comic sequences that make the entire performance a grand and amusing event. On the final evening of Mani Rimdu the villagers joint in an all-night Sherpa dance. 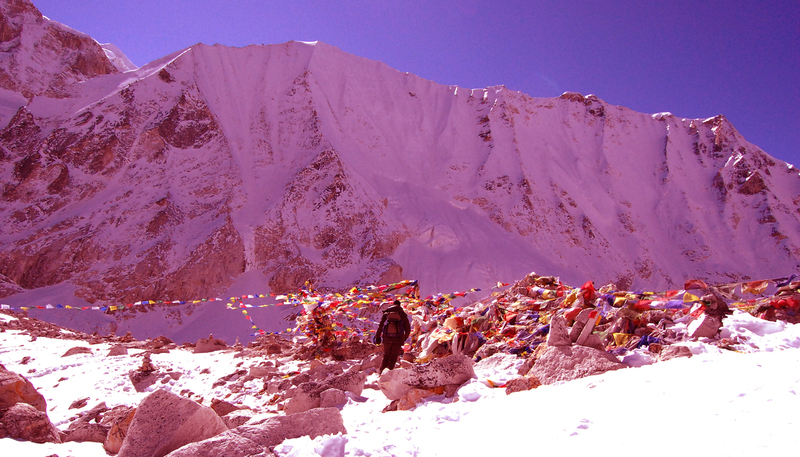 We have following trips of kala pathar Everest base camp which allows you to grace the festival at Tengboche. DAY 01/Sep.15/08: Kathmandu to Lukla flight 2830 m, & trek to Monjo 2850 m/6 – 7 hours. DAY 02/Sep.16/08: Trek Namche Bazzar 3440 m/5 hours, 60% steep hills up and one of the most high suspension bridge. DAY 03/Sep.17/08: Acclimatization day in Namche (day hike up to Everest view hotel 3890 m. and Khumjung village 3780 m) sightseeing etc.). DAY 04/Sep.18: Trek to Tangboche 3860 m/5 hours (one of the largest monastery in this valley). DAY 05/ Sep.19/08: Trek to Dengboche village 4360 m/5 hours. DAY 06/ Sep.20/08: Trek to Chhukung 4730 m, a beautiful walk (into the Imja valley the way to Island famous trekking peak). DAY 07/Sep.21/08: An adventure climb up to the Chhukung ri peak 5546 m/3 – 4 hours (from where awesome! rock outcrop offering splendid panoramas of Lhotse & Lhotse shar & it’s Ice wall in front of you, Makalu, Amadablam, Baruntse & the Island peak etc..) – then descend down to Dengboche or if you have time stay at Chhukung again and walk up to Island peak base camp next day. DAY 09/Sep.23/08: Rest day, hike up to southern part of Khumbu glacier & its moraine piles of rocks east south and numbers of blue lakes along the glacier. DAY 10/Sep.24/08: Early morning walk up to Gorakshep 5140 m, reserved room for the night, then after taking lunch headed to EBC 5367 m/1:30 - 2 hours one way – come back to Gorakshep. DAY 11/Sep.25/08: Climp up to Kalapathar (black rock) 5545 m/2:30 – 4 hours – then descend down to Lobuche (some of can make to Pheriche 4240 m. same day). DAY 12/Sep.26/08: Again we climbed up to Kalapathar directly from Lobuche 4910 m. then come back to Lobuche again in the evening, because we had to exercise very much for Chola pass to do. DAY 13/Sep.27/08: Trek to Dzongla 4830 m/4 hours maximum, (where very basic 2 lodges, but the trail to there is awesome! Awesome!! DAY 14/Sep.28/08: Climb up to Chola pass 5420 m/3:30 – 4 hours – then descend deep down to Dragnak 4700 m/5 hour (at all 8 - 10 hours). DAY 15/Sep.29/08: Trek to Gokyo 4790 m/2 – 3 hours (short and very beautiful walk crossing the southern part of Ngozumpa glacier). DAY 16/Sep.30/08: Climb up to Renjo la pass 5340 m/4 hours – then descend to the Bhote Koshi valley (passing be Angladumba Tsho lake above 5000 m,Relama Tsho lake 4970 m, and other lakes), then Marulung village comes at the elevation of 4210 m, from where the trail branches to Nangpa la trek along the eastern bank of Bhote Koshi river. We slept at Makyo village over night (9 – 10 hours). DAY 17/Oct.01/08: Trek to Thame 3820 m. /5 hours (the birth place of Apa Sherpa the World Record Holder, now 20th times summitted the Mt. Everest!). DAY 18/Oct.02/08: Excursion day above Thame monastery and we still climbed futher monastery, was fantastic! We had to look very deep down the top monastery of Thame. The monastery situated at 3970 m, but we did up to 4100 m.
DAY 19/Oct.03/08: Trek to Namche 3440 m/5 hours. DAY 20/Oct.04/08: Trek to Monjo 2850 m/5 hours. DAY 21/Oct.05/08: Trek to Lukla 2830 m/5 – 6 hours (the last night of trekking). DAY 22/Oct.06/08: By morning flight to Kathmandu – transfer to hotel, the trip is Ends. Namaste, wish you a best of luck! Bye see you soon!